but when I do, I choose the Outdoor Blogger Network." Seriously, if you like to read or write hunting, fishing, camping, or other types of naturelicious blogs, do yourself a favor and check out "the most interesting blog network in the world." Plus, it's brought to you by these two characters, so how can it be bad, right? You deserve an award for creativity here. A clear front runner in the quest for the "OBN Post of the Year" award. Oh, wait - we don't have a Post of the Year Award. 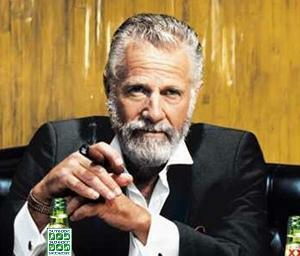 He really is the most interesting man in the world now that he knows about the OBN! I went with the "it's better to ask forgiveness that seek permission" concept today and may have lifted your photo and just put it on the OBN site. Thanks to the OBN for being fodder for the hijinks. Looks like a good aggregate site. I'm currently following the Outdooress on my twitter feed. Found you on OBN. You are funny. Therefore, I will follow you. Oh, and it seems you know how to fish too. All I can do is laugh! Nice job!